Beacon Builders' Mike Bradley says of cross-laminated timber: "I'm always interested in anything that's innovative or sustainable or both, and this is both." Spokane is getting what city planners believe is its first building made from cross-laminated timber or CLT, a wood building material that has people excited about its sustainability and the potential to put local forests to work. Mike Bradley, project manager with Beacon Builders, is excited about using CLT to build a new gym for CrossFit Duratus at 711 N. Helena St., about a half-mile from Gonzaga. "I'm always interested in anything that's innovative or sustainable or both, and this is both," Bradley says. CLT is lighter than concrete, saves on labor costs because it's easier to put together on site, and can save on time because rainy weather won't interrupt concrete castings — the CLT panels are custom-made at presses for each job. To make CLT, narrow boards are lined up next to each other and covered in glue, then more boards are stacked on top of that going in the other direction, with layers continuing to alternate 90 degrees. All of that is pressed to create an incredibly strong piece of wood that can replace concrete slab and steel construction in buildings. CLT can also be made from smaller trees than are used for typical lumber, and thinning out smaller trees can be good for forest health and decrease the spread of wildfires. Even trees that have been killed by beetles can be used, which prevents them from rotting and releasing carbon that is sequestered in the wood, meaning that buildings will have much smaller carbon footprints than with traditional materials, a selling point the timber industry is trying to drive home. Used for many years in Europe, CLT is getting attention in places like Portland and Seattle for its potential to support multiple-story buildings that are taller than those allowed with simple timber frame construction and cheaper than those using traditional materials. That could make a big difference when developers are choosing how tall to build, because concrete doesn't make financial sense below a certain height, and with limits on traditional timber construction, some structures in Seattle are 30 feet shorter than they could be, which means zones aren't being filled as densely as they are allowed to, according to a CLT feasibility study done by Mahlum Architects in 2014. In addition to making financial sense, CLT performs well in a variety of safety tests. The U.S. Forest Service is promoting CLT as a strong product that has been able to stand up well in seismic shake tests in Japan, blasting tests by the Department of Defense, and even in fires. "It seems really counterintuitive, but wood performs better than steel in a fire," Bradley says. "Steel doesn't burn, but it loses its strength really quickly as the temperature rises, but a big wood beam can burn for a long time before it loses its strength." He and others explain it like this: Think about starting a fire in your fireplace — if you hold a match to a large log, nothing will happen. It is very hard to catch a large piece of wood on fire without kindling. Plus, Bradley adds, new multi-story buildings will include sprinkler systems. Another thing that makes CLT unique is that unlike traditional wood, it resists shrinking, explains Logun Rasmussen, the engineer for the CrossFit Duratus building. With wood, if you have a brick veneer with wood studs, or wood walls with steel beams, you normally have to adjust the way you build to account for the wood shrinking, Rasmussen says. But because the CLT boards are layered in different directions, they help each other resist that shrinking. 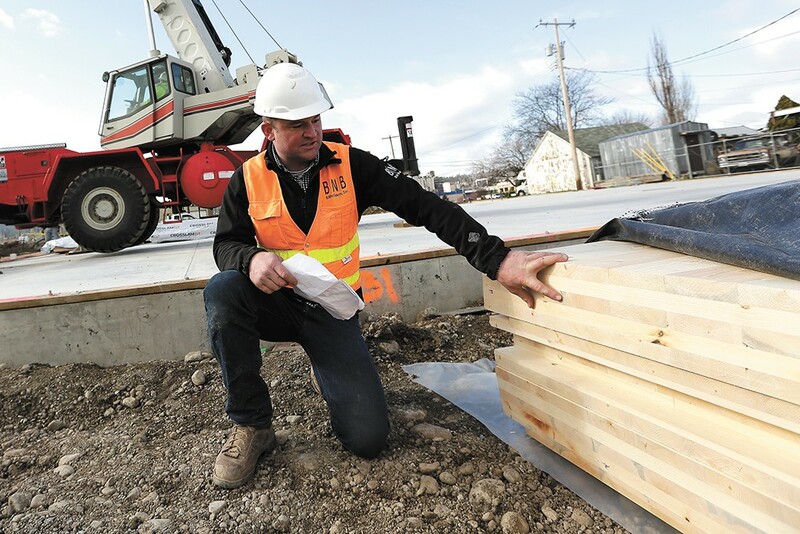 For the entire team working on the building in Spokane, using CLT was a learning process, since it's such a new material for builders in America. "Most materials you build with have been around a long time; everybody knows how to detail it and how it goes together best," Rasmussen says. "With CLT and something new, comes the hurdle of what works and what doesn't work." Architects Matthew Kerr and Eric Owens credit their client, Kevin Longmeier, for asking them to design his building with CLT. "He was interested in CLT and was a huge proponent of using the product," Kerr says. Normally, if someone came and asked for a big, open building for a workout facility, and they wanted it cheap and quick, you'd put up a metal building, Owens says. But CLT was a good choice for the type of workouts involved in CrossFit, which incorporate the building, from ropes hanging from the ceiling to using pull-up rigs and squat racks that are attached to the walls. This is the first building that Longmeier has worked on, and he wanted to be sure it was built responsibly and with an aesthetic appeal. "It's an eco-friendly product, and as a local business owner I have a responsibility to at least be mindful about the way things are built," he says. Aesthetically, the building will be much warmer from the inside, Owens says. "There's so much character and uniqueness in pieces of wood; no two are the same. You could have 1,000 pieces of steel all look the same," Owens says. "Something about these panels, and the character and experience they bring to a space, has a lot of merit." Longmeier hopes that will appeal to a future tenant, as part of the building was designed to be rented out. There aren't a lot of presses making the product close to Spokane. The panels used for the gym were made in British Columbia. But that could soon change, as companies in Eastern Washington are looking to get into the CLT business. "The timber industry has taken some big hits in the past few decades," Owens says. "It's a big part of the Pacific Northwest, and our economy and everything that makes this nation thrive." Getting back to using those resources and boosting the local economy, while capitalizing on a construction process that can save their clients money, is a good thing, he says.